"About 18 years ago, I was regretting to the late James Montgomery, the poet, of Sheffield, that hymns were so frequently printed differently from the originals as written by their authors. I pointed out the very hymn mentioned in the Rev. Edward Bickersteth's Collection as an example. He smiled, and said,'I altered it as you see it there; Bickersteth asked me to alter it.'" ”I entirely rewrote the first verse of that favourite hymn, commencing ‘There is a Fountain filled with blood.' The words are objectionable as representing a fountain being filled, instead of springing up; I think my version is unexceptional." When William Cowper, who had suffered from severe depression since the death of his mother when he was just six years old, was faced with the prospect of a final law examination before the House of Lords, he experienced a mental breakdown that he never fully recovered from. Having been sent to St. Alban’s asylum for eighteen months, he began to read the Bible, which brought some peace to his mind, and he was able to leave and live with his good family friend, famed author of “Amazing Grace,” John Newton. Newton helped Cowper recover, and together Cowper and Newton wrote poetry and religious verse, which they later published in their own hymnal. 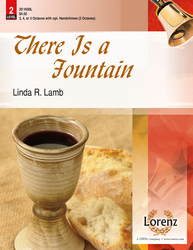 “There is a Fountain Filled With Blood” is one such hymn, and it is a dramatic illustration of Cowper’s faith. The last verse in particular speaks to Cowper’s hope of redemption; it reads, “When this poor lisping, stamm’ring tongue lies silent in the grave, then in a nobler, sweeter song I’ll sing thy pow’r to save.” The mental breakdown at his examination gave Cowper a lisp and stutter that he had the rest of his life, but he knew there was a greater song to be sung than any his earthly voice could raise, a song of praise to the dying Lamb. 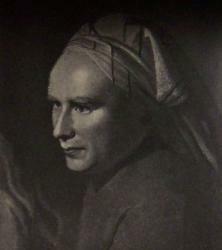 Cowper’s original text has undergone a few changes – many of them in the early nineteenth century by the hymn writer James Montgomery. While not all of these changes stuck, this change remains in many hymnals: in the 2nd verse, the last lines were changed from the declarative “and there have I, as vile as he, wash’d all my sins away,” to the prayerful “and there would I though vile as he, wash all my sins away.” I think this is a good change to the original, since it acknowledges that though Christ paid the price, we are still sinners in need of cleansing each and every day, waiting for the day when we will be washed clean forever. Now, as mentioned in the teaser paragraph, the first line of this text has raised some eyebrows and made some folks uncomfortable. The imagery of a fountain being filled with blood and then standing beneath that fountain as the blood pours over you isn’t the prettiest image. But then, when did we ever say our faith was pretty? Ray Palmer writes that this criticism “takes the words as if they were intended to be a literal prosaic statement. It forgets that what they express is not only poetry, but the poetry of intense and impassioned feeling, which naturally embodies itself in the boldest metaphors. The inner sense of the soul, when its deepest affections are moved, infallibly takes these metaphors in their true significance” (Lutheran Hymnal Handbook). The particularly uncomfortable and gruesome language of the first verse is meant to be just that – an expression of our deep discomfort when we acknowledge the awesome act of salvation made for each one of us. And the hymn doesn’t stop here. As we continue to sing, the gruesome imagery is layered upon by beautiful images of joy, faith, and hope. Isn’t this hymn then a true representation of the Christian walk? Pain and guilt, washed white by God’s grace – something worth singing about. 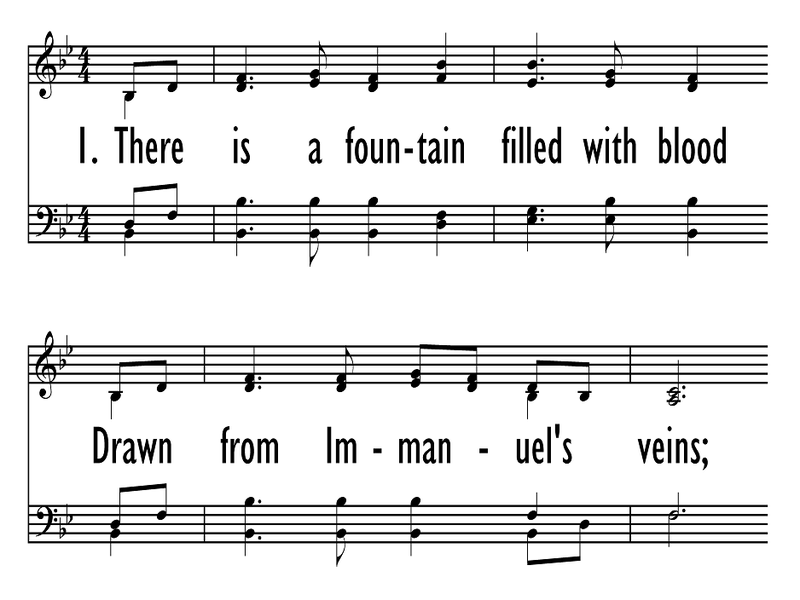 The tune CLEANSING FOUNTAIN was written by Lowell Mason in 1830 for Cowper’s text, and was first published in Thomas Hastings’ Spiritual Songs for Social Worship (1832). When this tune is taken too quickly, as is often done, it’s difficult to really sit with the words and dwell on the meaning of the text. A fast tempo can in fact cheapen the words, causing them to lose their power. Take it slow on this one – don’t drag – but give the congregation enough time to really chew on the words. Also, the moment you sweep up to the last line into the repeats is a big moment, so don’t be afraid to really emphasize the high notes. Karl Digerness of Cityhymns has a re-tuned version that nicely slows down the tempo and presents the text in a very reflective way. With some imagery of the Passion, this hymn works beautifully for both Lent and Easter, especially during Communion. However, the imagery is also generic enough to be used throughout the year as a communion hymn.